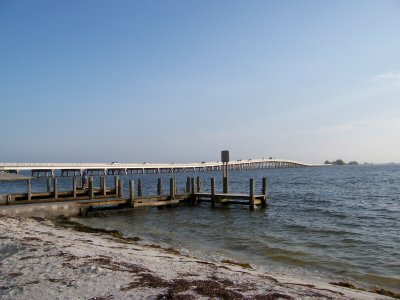 The trip from Fort Myers to Sanibel involves three bridges (which were rebuilt in 2007) connected by small manmade islands. Once you reach the end of the Causeway bridge, and are on the island, you'll be on Causeway Road until you get to Periwinkle Way. The Visitors' Center is on this street. After Periwinkle, the road continues as Lindgren Blvd. Cyclists staying in Fort Myers may prefer to ride the Causeway bridges rather than pay Sanibel's parking rates. Bikes are definitely allowed on the bridges. The bridge toll to Sanibel is $6 for cars, $2 for motorcycles, and free for bicycles. For larger vehicles, the fee is calculated at $3 per axle. There is no toll when leaving the island. For more information on the bridge and tolls, visit Lee County's LeeWay website. To see only the Causeway, uncheck the Show all bike trails checkbox below the map.